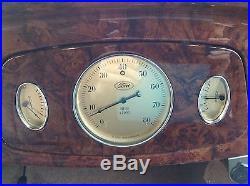 Mileage since refurbishment 4800 miles. 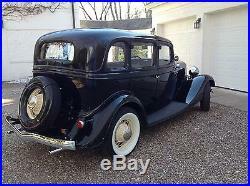 This car, having an all steel body, has been completely refurbished over. A 6 year period, ending in 2011. Most stock elements have been. Retained to preserve its original natural attraction. Been done to enhance road safety and dependability. 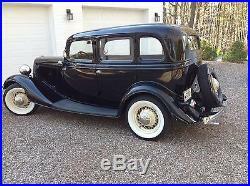 Included also is a library of 1934 Ford books/manuals and. Complete file of work done and parts installed In the car. 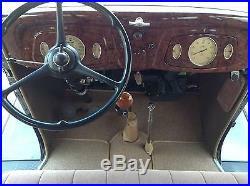 In essence, you are being offered a turnkey package of car, spare parts. And background literature verifying the integrity of the refurbishment while providing a carefree, safe and enviable driving and ownership experience. 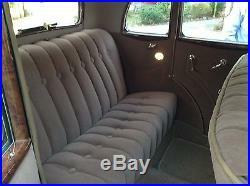 Upholstery was completely redone using a LeBarron Bonny 1934 Ford Mohair kit. 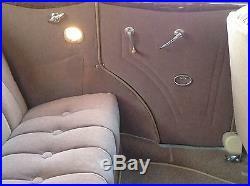 Front seat is a built-up of solid foam while the rear is a new Ford spring seat. Floor and door panels were sound deadened. Custom rugs were made and an acoustic treated firewall panel applied. Three point seat belts installed. Garnishes and dash wood grained via the Water. 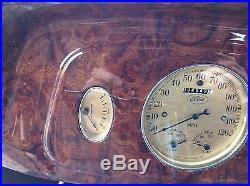 Senders from Classical Instruments were installed including a tachometer, voltage and ammeter. Front and rear seat courtesy lights installed. Door pull rings and locks installed on all doors. Steering wheel is NOS with a. Steering wheel needle shaft bearing installed. 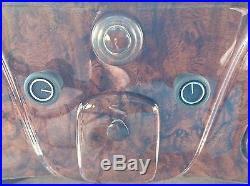 Turn signal switch and defroster vents are VW parts selected to compliment interior. 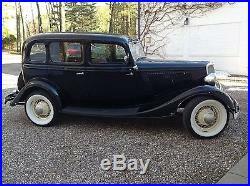 The cars steel body, was found to be in excellent shape thus requiring little body work. It was primed, painted black and top coated. The under body was sand blasted and spray coated with rubberized undercoating. 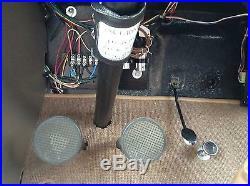 All new glass, window runners, slides/rubber water proofing guides and SS beaded fuzz strips were installed. New Drakes running boards, chrome work installed. New roof top kit installed. New headlights, tail lights (LED) turn signal lights front and rear were installed. All new, individually strung, wires (no kit) with a hot and switched fuse block under hood were installed. A 12 volt negative ground system with an Optimal battery, a security system and emergency flasher has been installed. 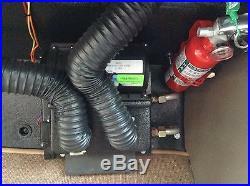 A Mallory electronic ignition system, ignition coil, ballast resistor and power cell installed. 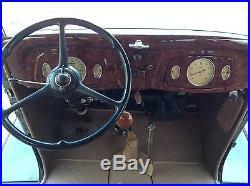 Alternator, starter motor, starter switch (dash mounted) are new. 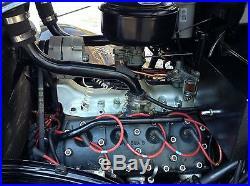 The engine is an overhauled 59AB V8 flathead bored. Crankshaft is a 4 kit from Speedway Motors. Camshaft is an Isky 77B mild race cam. 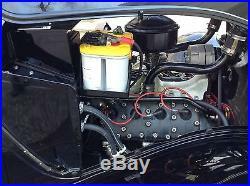 Carburetor, water pumps, radiator, fuel pump, gas tank. 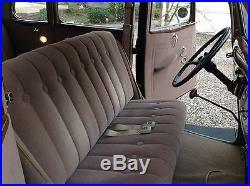 Oil pump, clutch are new or refurbished. 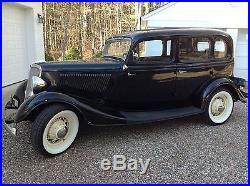 The transmission is a 1939 Ford reconditioned. The differential is a 3.54:1 option from factory. Shock absorbers, front spindles, Pitman arm, kingpins and steering box either new or refurbished. 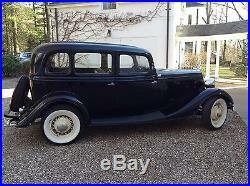 Wheels are 1935 16 inch Ford spokes, sand blasted, painted and run out checked. Tires are new Diamond Back Dunlap 215-70R. 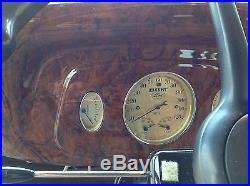 Brakes are hydraulic from the Early V8 Garage made from 1939 cast iron Lincoln self energizing brakes. Dual exhaust system including Fenton cast iron headers, stock mufflers and resonators are installed. A complete list of spare parts and literature, as well as detailed specifications, are available upon request. 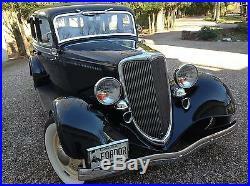 There are ten You Tube videos of this car from 1-10 and can be seen via 1934fordor1,2,3 etc. 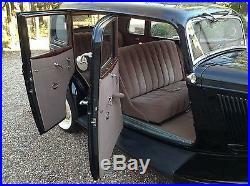 This vehicle may be listed elsewhere and we reserve the right to end this listing at our discretion. For those buyers who may require a vehicle transport, we recommend the use of Auto Bahn USA. 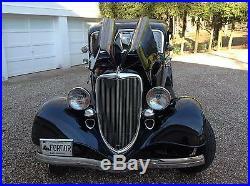 The item "1934 Ford Model A Fordor Duluxe" is in sale since Thursday, April 27, 2017. 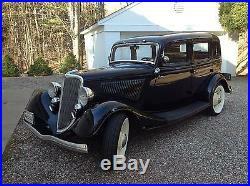 This item is in the category "eBay Motors\Cars & Trucks\Ford\Model A". 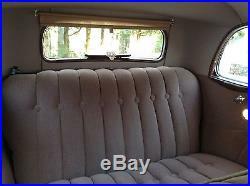 The seller is "ekimitram" and is located in Simsbury, Connecticut. This item can be shipped to United States, Canada, United Kingdom, Australia.